Other presidential campaigns have begun reaching out to financial and political loyalists to Rick Perry after the former governor suspended his 2016 campaign on Friday. As various presidential campaigns jostle over the financial bones of Rick Perry’s second presidential campaign, political observers were reminded how far Texas’ longest-serving governor had fallen from his perch as the most powerful and feared figure in Texas politics. Perry’s suspension of his 2016 presidential campaign on Friday also recalled the fundraising woes that had hobbled his campaign in the first place, leaving him with a skeletal staff in the early voting states and barely enough money to travel. Once the front-runner for the GOP presidential nomination in the 2012 race, Perry’s candidacy fizzled amid a series of high-profile missteps. He entered the 2016 campaign saying he was better-prepared for a run at the White House. But even with big donors — including some wealthy Texans — giving generously to super PACs supporting his bid, Perry couldn’t break through when it came to driving direct donations to his campaign. Among Perry allies and other Texas Republicans, there are several explanations for why his fundraising dried up: He was part of a massive 17-candidate GOP field with plenty of ties to Texas, he no longer had the perks of being a sitting governor, he could never convince the donor class he had truly improved over his last bid, and he could not dispense with his abuse-of-power case, which remains pending. “I think that was less an issue for non-Texans, but for Texans, it seemed to be a real factor in trying to get dollars out of Texas,” Barbour said of the indictment. The most immediate consequence of Perry’s exit Friday was that in the minutes and hours after his announcement, the phone lines were burning up between other presidential campaigns and Perry’s financial and political loyalists. Getting direct contributions was clearly the struggle of Perry’s 2016 campaign, and sources say that the last campaign’s problems undermined his ability to raise money this time around. But there are still Perry donors to be had. To rival campaigns, there are two types of Perry supporters up for grabs: Those who had already opened up their wallets for his 2016 campaign and those who were sitting on the sidelines, waiting to see how his bid shook out but not giving to other candidates. One operative from another presidential campaign said that there was such a strong internal belief of an imminent Perry dropout that a contingency plan was in place for that candidate to reach out to as many donors as possible in the hours after Friday’s announcement. Another unaligned GOP source in Texas noted the $17 million burst Perry raised early in his previous presidential campaign and described that donor list as “very fertile ground for presidential campaigns." Several Republicans in Texas said that it was a wise choice for Perry to cut his losses. “I think he saw the writing on the wall,” longtime Perry fundraiser Roy Bailey said. “And as much as those of us who were big loyal supporters hate it …. that as much as he wanted it and as competitive as he is, it would be easy to grind it, go to the debate, bootstrap it … but if you feel in your heart you’re not going to get there, to put your family and loyal supporters through it, it’s really an honest, nice thing to do,” he added. U.S. Sen. Ted Cruz, the other Texas Republican running for president, may be the most immediate beneficiary of Perry’s departure. With the former governor out of the race, Cruz has the opportunity to expand his home-field advantage and fend off out-of-state candidates lured by Texas’ earlier-than-usual primary date. A Texas Republican consultant told the Tribune that the Cruz campaign has already sought out endorsements among state legislators who have long ties to Perry. And as it became clear Perry’s campaign was on its deathbed, Cruz’s people were taking more calls from potential converts. But other presidential campaign fundraisers and operatives say no, that it is open season in Texas. There are plenty of candidates with ties to the Lone Star State and even the ones who do not, like New Jersey Gov. Chris Christie and Florida Sen. Marco Rubio have made inroads among the donor class. “Texas has always been a free-for-all,” said Ray Washburne, Christie’s finance chairman. Perry’s $1 million haul during the first month of his campaign was so meager that it set off alarms within a super PAC backing him. That PAC immediately started working to prop up the campaign in Iowa, recruiting staff to work in the Hawkeye State. Just Friday morning, the group was informing supporters it was returning to the Iowa airwaves with a TV ad. Later Friday, the super PAC, which cannot coordinate with the campaign, was blindsided by the news of Perry’s exit. The group still has roughly $13 million in the bank, and it was planning to meet with its lawyers over the weekend to plot its next steps. Asked whether the super PAC plans to use its remaining funds to go after Donald Trump — Perry’s chief antagonist from the race — Barbour scoffed at the idea, saying there had been no discussions about that. 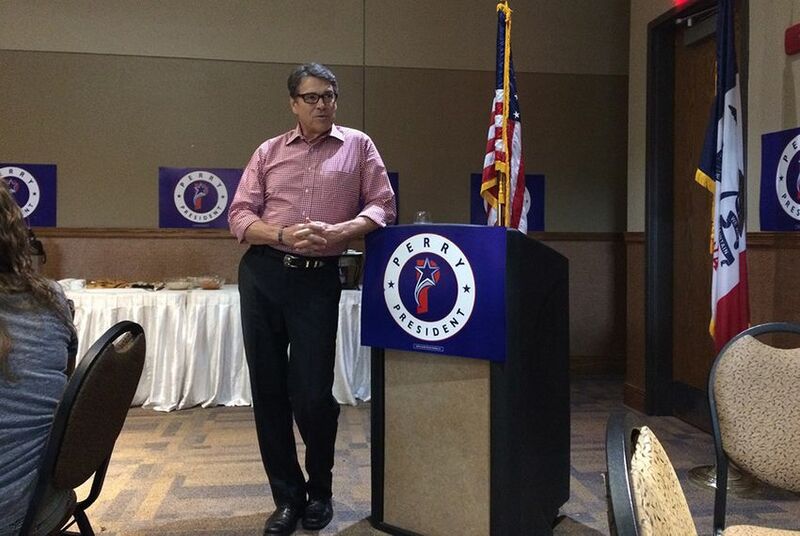 “We haven’t been thinking about anything but Rick Perry,” he said.